Sound in Tankwa Town? For some time, it’s been the thing that illustrates best the inherent tension between our principles – and that’s what makes AfrikaBurn an ever-evolving experiment. These guidelines are here to help ensure the greatest amount of creative freedom while also helping to create a collaborative environment. Why do we need a sound policy? The challenge presented by the limited size of our event site and the dominating effect of large sound systems has led to the development of this sound policy. 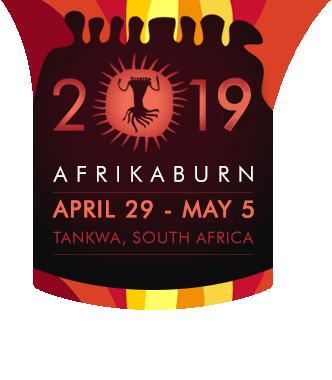 Other factors in play are that whilst AfrikaBurn is dedicated to radical self-expression, it’s also dedicated to creating community, which means we all must find a way to work together. Recognising that an immersive sound experience is important to many people’s experience of the burn, this policy isn’t aimed at favouring one form of expression over another but is rather designed to find a balance that honours the efforts and contributions of all participants. If your Artwork, Theme Camp or Mutant Vehicle (MV) has an amplified sound component, be mindful of the impact on the environment around you. AfrikaBurn is dedicated to radical self-expression, but it is also dedicated to creating community. Sound pollution, or SOOP (Sound Out Of Place), can have a negative effect on the experience of your Tankwa neighbours. Artworks, Theme Camps, Mutant Vehicles with sound systems are required to register their systems and indicate their size on project registration forms. In addition, they’re also required to appoint a sound officer. This person assumes responsibility and accountability for any sound issues or complaints. Be aware that Tankwa Town has a limited amount of space and therefore we will limit the number and sizes of sound systems on site if it becomes necessary. Speakers must face away from residential areas with consideration of the sound layout of the city for that year(and nearby art works), and be aimed to create a focused sound zone. In other words, the orientation must be downward and focused inward towards the space, to ensure sound bleed isn’t a major factor for nearby artworks, theme camps or other sound systems. Raise your bass bins off the ground, using pallets, truss, scaffolding or other means of elevation. When registering your sound system, consider that you need to match your sound system with your expected number of participants (and the size of the space you’ll be occupying at the event). Your planned size, technical spec, and orientation will be reviewed by the respective Theme Camp, Mutant Vehicle or Artwork team during your registration process – and once your system has been set up on site, will be checked against your registration details and signed off. system for 100 people or 5000W for 500 people. Any changes to the size of your rig will have to be made prior to the Placement team’s planning exercise, in order for sound to be factored into your location. The deadline for this is mid February. Sound Rangers will respond to persistent complaints and will measure decibel levels. Sound installations are requested to comply with a measurement of 90dB SPL (A-weighted) at a distance of 10m. They will also request that you reduce sound levels if there are few people on your dance floor. Remember, your rig is operating in a community, and there’s no competition to win Loudest Rig On Site. Talk to neighbouring sound systems in your area – discuss your plans for the week and work out a schedule that enables your rig and crew to have both live time, and downtime. This way, every rig will be able to perform at its best without exhausting you or your resources. Early arrivals: testing rigs before gates open is fine in order to be ready for the week, but please don’t crank it hard until dawn before the official start of the event. Save your batteries: it’s a long week and popping your desert cherry early will break your crew and make the rest of the week a long slog (this is also a condition of our land lease). Binnekring sound curfews. Please be aware that there are restrictions on sound times for different zones. These will be published on the map – we ask that you PLEASE adhere to them, so that happiness reigns across the plains. Sound Rangers will be at the event from Friday before the event to assist with sound system set ups. Please ask Ranger HQ (or Arteria, which is next door at OCC) to call them in if needed to avoid double handling. Silent Temple Burn. Please assist in complying with the artist’s request for a silent burn and allow at least a 20 minute silent buffer before that burn (subject to change due to weather conditions). There will be a signal when the silent burn ends. Mutant Vehicles are specifically requested to respect the silent period and watch for ON/OFF signals from Rangers or Perimeter Crew. advised of the Loud All Night Zones and any restrictions or curfews in certain areas. The same common sense ideas apply to them. Sound schedules for specific locations will need to be co-ordinated with Sound Rangers. The curfew for campsite sound systems – including car systems – is 10 pm. Sound Committee will review the proposed placement, orientation indicated in sound project registrations. On site, this will be signed off once the rig has been set up. Any changes to the signed off plan (submitted in registration) must be signed off by the Sound Committee. If you are bringing a sound rig as your Theme camp gift, it is a requirement to camp next to your rig. This is in order to ensure that sound crews are always aware of the throw, loudness and potential impact their rig is having on neighbouring areas and camps. serious negative effect on wildlife by causing constant stress. Mandatory switch off times: 7am – 11am Monday – Thursday. To allow a mental break for our participants as well as the beautiful silence of the Tankwa desert we require you to switch all amplified sound during these times. Live music, silent discos, choirs, whistling, humming, harpsichords, string quartets and Radio Free Tankwa at a low volume are encouraged. This includes generators. placement, orientation, Silent and Artwork burns. The meetings are designed to ensure all rigs get to enjoy the best exposure and share the space to the best effect. DJ’s must be briefed to stop between and during their sets to call out to dancers to pick up dancefloor litter or do MOOP swoops. If they’re unable to shout above the crowd, use a mic or loudhailer (or just find a really loud friend). We reserve the right to request changes to the orientation and location of speakers. Play wonderful music and have lots of fun! Thank you from our Sound Committee Members – Ian, Brian, Monique, Ivan, Alastair, Robert, Karl, Richard and Sonica. as a Sound Ranger (or just have ideas & suggestions). Hit this link to find out about our Generator Policy!